Easy to work with, approachable, and a great expert in this area … He’s very assured and good with clients. James regularly acts on behalf of banks, building societies and other financial institutions. He advises on a wide range of matters relating to consumer credit and financial services. He was selected as the Banking & Finance Barrister of the Year (UK) by the Lawyer Monthly Legal Awards 2018. 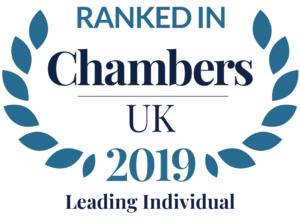 James regularly appears on behalf of creditors and assignees in debt recovery claims which are defended on technical grounds under the CCA 1974. Acting on behalf of a merchant in a substantial charge back dispute with the merchant acquirer and card issuer following the fraudulent use of a credit card. Drafting pleadings and mortgage agreements, including equity purchase schemes. James also acts and advises in relation to criminal proceedings brought by trading standards departments and other prosecuting authorities, as well as civil claims for enforcement orders under the Enterprise Act 2000. Carey v HSBC Bank plc  EWHC 3417 (QB),  Bus LR 1142: Instructed by numerous banks in the Manchester litigation leading up to the decision in the Carey case relating to sections 61 (prescribed terms), 78 (statutory copies), 140A (unfair relationships) and 142 (declarations of unenforceability) of the Consumer Credit Act 1974. General editor of Modern Financial Regulation, (the ‘Blue Book’), Jordan (2013). Founding editor of the Consumer and Trading Law Cases (CTLC) series of law reports published by chambers and available on Westlaw. James is authorised to accept Direct Access instructions, usually from businesses and professionals.